Information: The old church of St. Venera was given to the Carmelite friars in 1912, and six years later it became a parish church. 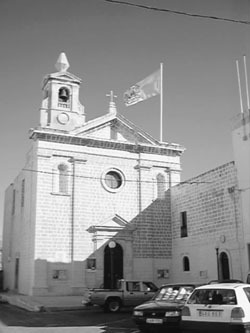 Because of the rapid increase of the population in the locality the friars decided to build a new church on the main road to Mdina. The foundation stone of the church was laid on the 6th October 1990, and the new church is now the parish church of the locality. Priest: Parish Priest: Rev. Alex Scerri O.Carm.